For those of you who have spent a bit of time in a gym, you may have already seen a balance board or two. It is a fairly simple piece of equipment that destabilizes your position in order to make you engage stabilizing muscles in the core and legs. The company Fluidstance brings us their take on the balance board but in this case, one that is designed and built for office and home use. The Fluidstance team started with an original design, aptly called the Original, and have expanded their range into a number of different balance boards. 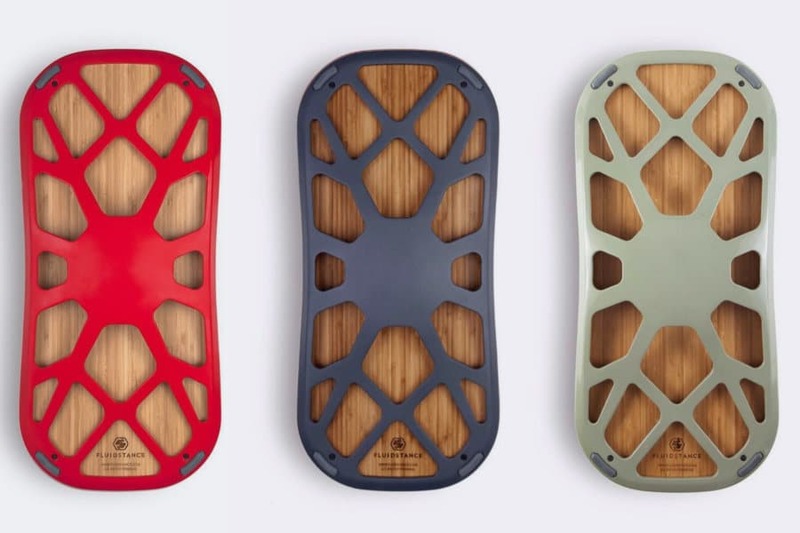 Firstly, a quick overview of balance boards. A balance board is generally a small board, either round, oval, or oblong, with a flat side and a curved side. The flat side is the side that the user stands on, while the curved side provides the instability which forces the user to be engaged and balanced at all times. Imagine something like skateboarding or surfing would be like. On these types of boards, you are constantly adjusting to small movements and rebalancing your body with micro-adjustments. Skateboarders and surfer have fantastic core stability, the muscles in the legs, abdomen, and back are constantly being put to the test. Now, the Fluidstance aims to do the same thing, only this time at home or in the office. They have four main balance boards in their range: The Original, The Level, The Plane, and The Grade, all which you can see in the table below. 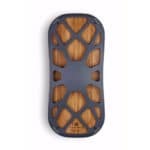 Balance boards are also said to improve overall concentration, increase energy expenditure, and increase your heart-rate. 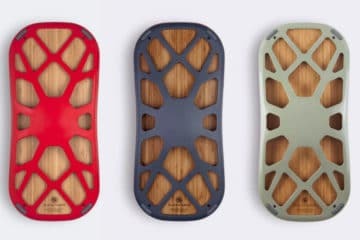 In fact, the balance boards by Fluidstance are all NEAT certified by the Mayo Clinic meaning that they are proven to burn extra calories without added exercise. The Platform: 0.5-inch 3-ply bamboo. First and foremost, we must mention the build materials and build quality of this product. This isn’t your typical wooden or plastic balance board. With the beautiful bamboo platform and an amazing sand-casted aluminum frame, the Original is really at the top of the range when it comes to building materials. Furthermore, this product is built in an eco-friendly fashion: bamboo is one of the most renewable sources, the sand-casting generates zero waste, and the powder-coated finishes generates almost no emissions when compared to other painting methods. When buying a balance board, it is important to consider the design and shape of the board. If a board is too high for example, it can place unnecessary stress on your knees and ankles, and can, in fact, be dangerous. The Original has a very low profile (2.5″) and has around 24 degrees of movement from its flat position, to the edge touching the ground. It gives you enough movement to feel destabilized, but not so much that your body is in awkward positions. Lastly, at its size and weight, it should be compatible with most users. It is heavier than your average balance board, but this added weight comes from the raw materials used and gives the product added stability as well as a high weight capacity (up to 300 lbs). 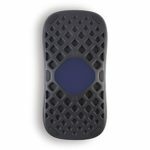 The size is small enough to be used in most office environments and big enough so your feet fit comfortably on the board. The aluminum frame, despite being sturdy and well-built, has some drawbacks. 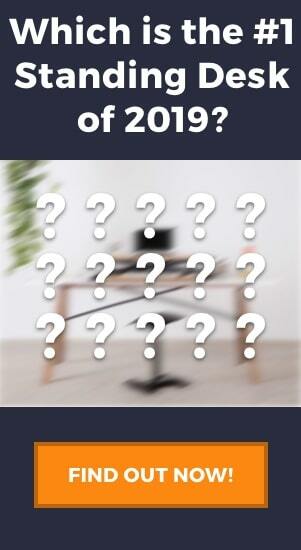 Depending on the surface of your office floor, you might encounter one of two issues. Firstly, if you work on a carpeted surface, there may not be enough friction between the aluminum and the carpet and the board will have a tendency to slide. Secondly, if you work on hardwood, the aluminum frame is not the most friendly material. It is possible that you can scratch and damage hardwood surfaces. Fortunately, the folks at Fluidstance also make base-mats for these exact problems. 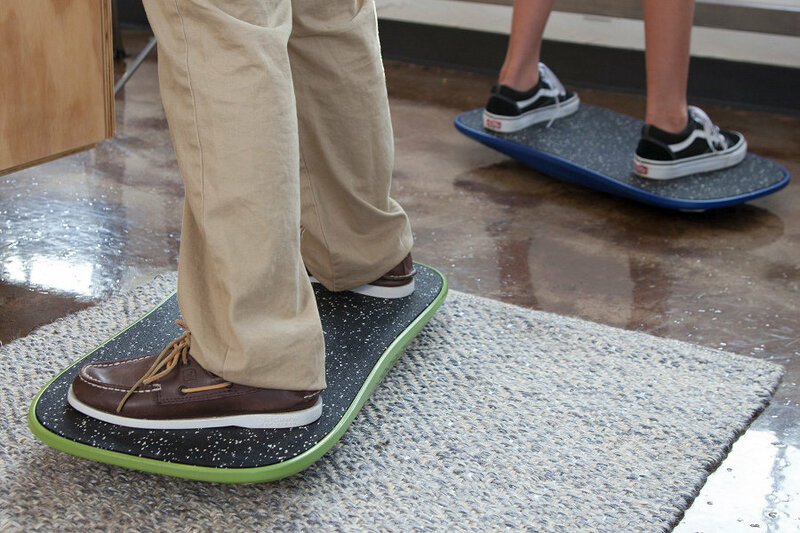 The mats designed by Fluidstance are made from recyclable materials and are designed to provide a stable surface for the balance board, as well as a cushion between the aluminum and the floor surface, avoiding scratches. 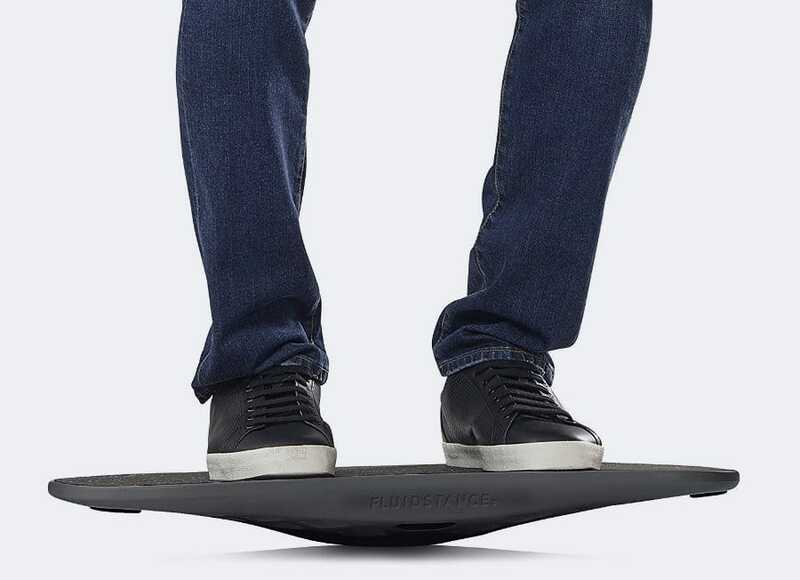 Lastly, the Original balance board by Fluidstance is a pricey product. 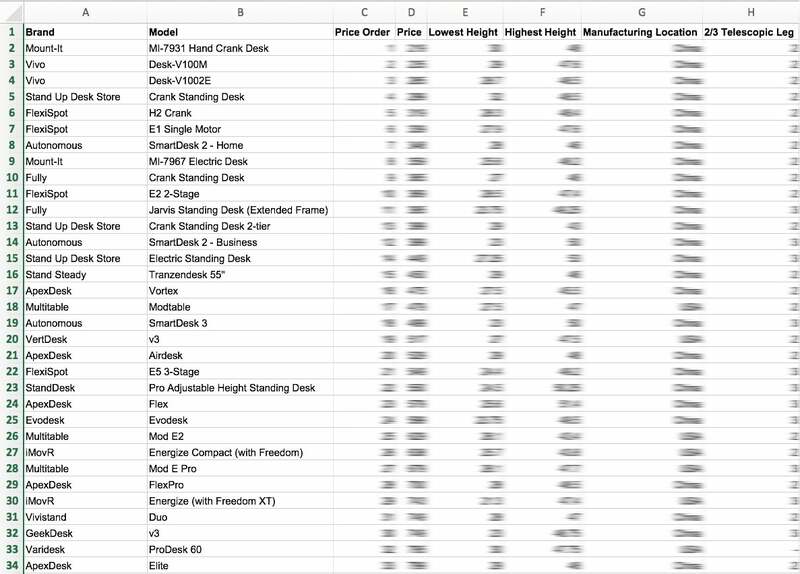 When you take into account the products used, the manufacturing process, and the design and quality of the product, it all adds up, however, many people aren’t prepared to pay that much for a balance board. We love the fact that the Original is an eco-friendly product. This is a step that many companies are starting to make these days due to growing climate concerns, and Fluidstance is among them. This does cause the price to be higher than a standard balance board, but you are paying for quality of materials, design, and the eco-friendly manufacturing process. Ergonomically it is a well-designed product that focuses on creating movement without creating further problems. Using this balance board in your daily routine will help engage core muscles and create an active standing environment. The Platform: 0.5-inch 3-ply bamboo, natural maple, or walnut (varying prices). We’ll keep this section pretty short and sweet because essentially we are looking at a very similar product to the Original. The major changes are the use of different materials, a different style of casting, and a thinner aluminum frame. We like this product because we believe it is a more wallet-friendly version of the Original. Fluidstance has added the possibility of using cheaper woods, and also incorporated a thinner aluminum frame, to reduce the cost of this product almost 40% (subject to which wood you choose). It also maintains all the previously mentioned qualities of the Original, the eco-friendly build, the same size and weight, the same beautiful and ergonomic design. As we mentioned with the Original, the Level also has the same issue when it comes to sliding and scratching your flooring. To get the full benefit of this amazing product without these problems, it is best to also purchase one of their mats to go with it. Additionally, due to the thinner aluminum frame, the weight capacity of the Level is 50 lbs less than the Original. At a 250 lbs weight capacity, the Level will still hold up for the majority of the population, but for our heavier readers, you may need to stick to the Original. Its great to see a company that provides so much choice in their products. We like the fact you can select the wood you would like, and being able to get yourself a cheaper balance board. We love the fact that the Level maintains all the essential features of the Original, only really dropping the weight capacity by 50 lbs, whilst also dropping the price tag. Although they are both great products, we give the Level an extra point for being a bit more economical than the Original. The Plane and The Plane “Cloud” (cushioned-top model) are the cheapest balance board models available by Fluidstance. Don’t let the price fool you though, as cheap price does not mean cheap quality! The boards are made from 100% recycled materials, and the boards themselves can even be recycled. This is important to note because many products advertise that they are made from recycled materials, but this does not make them automatically recyclable themselves. Unlike the previous models with aluminum frames, the plastic is also much more floor friendly. So instead of having to buy a balance board and the mat to protect your floor, you can just use the balance board by itself (although many users like the added stability a mat gives them). The surfaces you can choose are a firm tire top, or a soft cushioned top ($50 more expensive). These are both well gripped and can be used with or without shoes. Even after scouring the depths of the internet trying to scrape any negative reviews of this product, we just couldn’t do it! 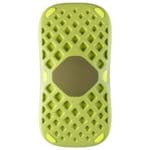 There was one person who said that in their opinion the product was more of a gimmick than a useful tool, but this is more an opinion of balance boards in general, and not of this particular product. The only issue that we could see is the weight capacity. 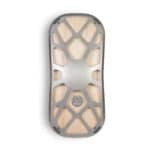 Unfortunately, if you weight more than 200 lbs then Fluidstance doesn’t recommend this product for you, and you’ll have to look at either the Level or the Original for a strong balance board. We have to admit, the beautiful design of aluminum and bamboo or wood is really hard to beat, and in terms of aesthetics, the Original and the Level are two amazing products. In saying that, it looks like the Plane really takes over in most other categories. It’s cheaper, smaller, lighter, still strong and well-built, and it doesn’t have the same issues with scratching your flooring. We also love the fact that it offers a cushioned top as the use of balance boards can be tiring on your feet. You must consider that the Plane only has 200 lbs weight capacity, but apart from that it is an outstanding product and really hard to fault. Firstly, this product is targeted for kids, promoting active lives in a fun way. This fact alone in our opinion is a great plus for the Fluidstance Grade, as we believe active lifestyles should be promoted from an early age. By creating a fun product with kid-friendly colors, kids can use it while the work, play video games, you name it! Once again this product maintains the same high standards as the previous products: 100% recycled materials, high-quality design and build, ergonomic shape, as well as the floor-safe plastic base. It is also far cheaper than the other products, only about 60% of the price of the Plane. This means if you have more than one child you won’t have to worry about breaking the bank getting each one of them their own child’s balance board. The only bad thing to note, as we seem to say a lot in these reviews, is once again the weight capacity is lowered. This obviously makes sense given this balance board is specifically for children, but be aware that they will outgrow the product at some point. A really great product to promote active and healthy lives to your kids. The Grade will get you kids standing and moving in a fun way for doing their homework or even playing games and watching T.V. This balance board comes at a great value and has the same high-quality build as the other Fluidstance products. Your kids may outgrow the products one day, being that the weight capacity is only 125 lbs, but at least you can rest easy knowing that the product is recyclable. As Fluidstance themselves say, “Good for your kids and for the planet!”. All in all, we really like the products by Fluidstance. They are all very high quality, beautifully designed, and ergonomically accurate for promoting healthy, active standing. 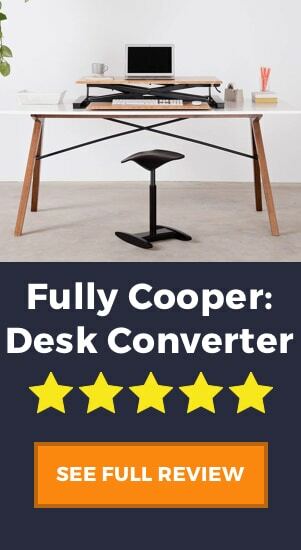 These products go great with standing desks and allow you to move and activate your muscles while working. The only drawback we see is the high price on some of the products, but otherwise, we’d give them top marks. We also love the inclusion of children’s balance boards in their range. It is a strong belief of ours that health and fitness habits start at a young age, and so getting your kids interested in doing something active and fun is really important. We also have to give the company full credit for their eco-friendly processes. All the products have been designed and manufactured in a way that uses the most environmentally friendly products, including bamboo and 100% recycled plastics, and their manufacturing process reduces as much waste as possible. They seem like a forward-thinking, environmentally-friendly, and family-friendly company that makes great products, so go ahead a give them a try! We’ll leave you with a final video, this one by the company, that goes into their story and background.